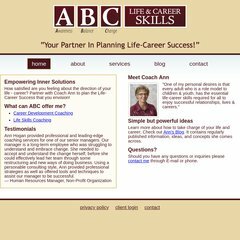 abclifecareer.ca Coach Ann&apos;s Life & Career Blog - Calgary Life and Career ..
theonequestion.com Find Purpose and Meaning In Life, Live Your Passion. The programming language environment is PHP/4.4.9. It has 2 DNS records, ns1.mediatemple.net, and ns2.mediatemple.net. Media Temple Inc. California is the location of the Apache/2 server. PING www. (64.13.192.86) 56(84) bytes of data.